Stuart Mason Music – Page 15 – Old is the new alternative. Old is the new alternative. Radio Ballad #3: ‘Every Little Curve In The Road‘ is a profile of musician Stuart Mason (Molly’s Revenge, Little Black Train). Mason’s long and varied career embraces both the Old Time and Irish traditions and covers territory from the mountains of West Virginia to the beaches of Maui. He is the proud owner of a banjo carved like a steelhead trout, and in this interview he talks about hellbenders, lullabies, and what it takes to make a living as a musician. A fun, refreshing fusion of vintage fiddle tunes, blazing mandolin, and songs of old-time Americana. What do you get when you mash up a virtuosic bluegrass mandolinist, a traditional Irish fiddler, and an old-timey songster? 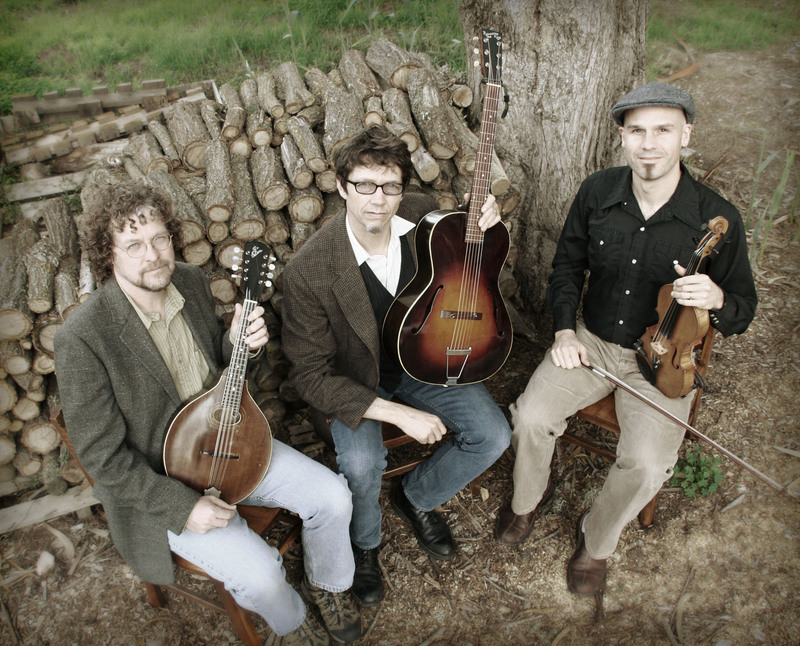 Kenny Blackwell (mandolin and guitar), John Weed (fiddle), and Stuart Mason (guitar, banjo, and mandola) are the bluegrass-roots trio Little Black Train. From Depression-era gospel and blues to Appalachian and Celtic dance tunes, they dig up the roots of bluegrass that traveled to America from Ireland and Scotland in the 19th century. Avid practitioners of the time-honored folk process, these boys combine new words and melodies with traditional songs from sources such as the Carter Family, Doc Boggs, and Charlie Poole. On the instrumental side, they mine fiddle tunes from archival sources in West Virginia, Ireland, and Scotland. Mandolinist Kenny Blackwell, who studied with the legendary Jethro Burns, has been a fixture in the West Coast bluegrass scene since the late ’80s. He is known for his extensive studio work on various projects, as well as his collaborations with progressive fiddler Richard Greene and his membership in the Laurel Canyon Ramblers, a legendary California bluegrass outfit. An accomplished fiddler across genres, John Weed has lived in Ireland and immersed himself in the traditional styles of Clare and Donegal. The result is an old-time Irish fiddling style that compliments his forays into bluegrass, swing, and other American music. A classically trained violinist, John leverages his understanding of the instrument to coax emotion from every tune. Guitarist Stuart Mason is known for his authentic vocals, melodic mandola, and inability to hold his whiskey. A native of West Virginia, Stuart has won awards for traditional singing (Goleta Old-Time Fiddler’s Convention), mandola (Topanga Banjo and Fiddle Contest), and songwriting (West Coast Songwriter’s Association). In 2009 a song from his solo release “Appalachian Bride” was selected from among 286 entries to appear on the first New Times Music Awards Compilation CD. 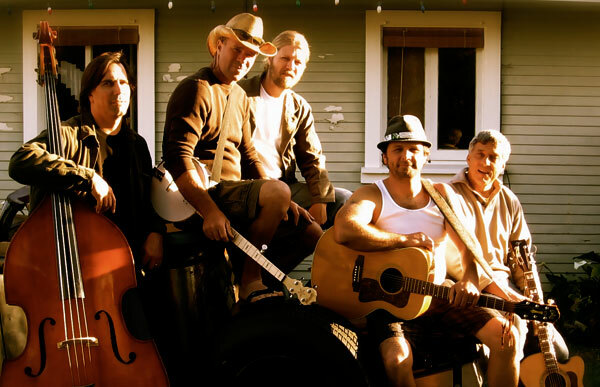 Acoustic folk and country bands Little Black Train, Mud Thump, and Mother Corn Shuckers will be performing at the Morro Bay Folk and Fiddle Festival on Saturday, May 22 at the Pelican Grill in Morro Bay. Each band will perform a one-hour set of lively down-home music, followed by an old-time sunset jam session at the end of the day. Musicians are encouraged to being their instruments. Admission to the festival will be $15, with all proceeds to support the musicians. Performance schedule is Mother Corn Shuckers at 1:00, Mud Thump at 2:30, Little Black Train at 4:00, and sunset jam session at 5:30. Food and beverage will be available at the venue. Seating is limited. With an all-star lineup of veteran string wizards Kenny Blackwell, John Weed, and Stuart Mason, the headliners Little Black Train will perform vintage fiddle tunes and old-time songs from their new self-titled release. From Depression-era gospel to Appalachian and and Celtic dance tunes, they explore the roots of bluegrass that date back to the nineteenth century and earlier. 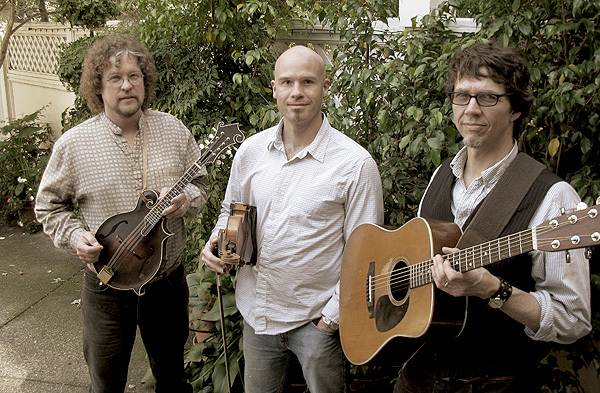 They employ the time-honored “folk process” to combine new words and melodies with traditional songs from sources such as the Carter Family, Doc Boggs, and Bob Dylan. The new record also includes fiddle tunes from archival sources in West Virginia, Ireland, and Scotland. Mandolinist Kenny Blackwell, who studied with the legendary Jethro Burns, has been a fixture in the West Coast bluegrass scene since the late ’80s. An accomplished fiddler across genres, John Weed has lived in Ireland and immersed himself in the traditional styles of Clare and Donegal. Guitarist Stuart Mason, who also plays mandola and banjo, is known for his authentic vocals and inability to hold his whiskey. 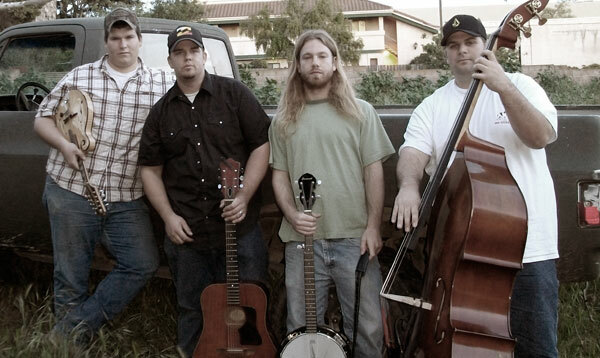 Mud Thump plays lively original songs that run the gamut from old-time bluegrass to new acoustic alt-country. 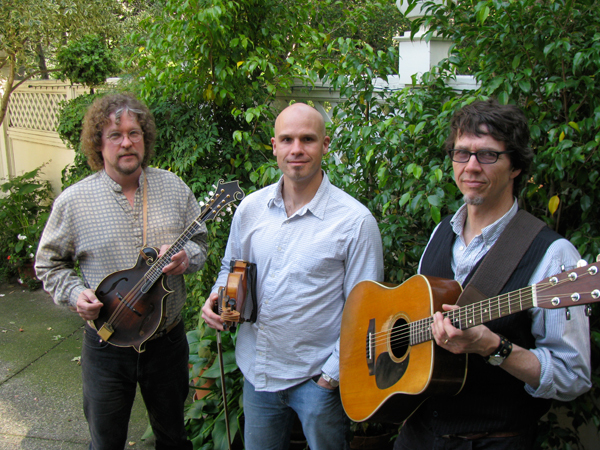 Guitar, mandolin, banjo, and bass fiddle combine with strong harmonies to produce their homegrown sound. With backgounds ranging from jazz to country, and strong original material, Mud Thump is a new band that has earned its place in the Morro Bay Folk and Fiddle Festival. Opening the festival will be the Mother Corn Shuckers, an acoustic Americana outfit consisting of Che Miller on guitar and mandolin; Shawn Canon on guitar and mandolin; Mark Hughes on banjo; Jeff Pienack on guitar and harmonica; and Alan Vogan on bass fiddle. Call 534-9021 for more information. The Clubhouse at This Old House will present “oldternative” bluegrass band Little Black Train on Friday, April 23, 2010 to celebrate the release of their new album “Little Black Train.” The cozy lounge with stone firepace and rustic beams will form the backdrop for Kenny Blackwell’s blazing mandolin, John Weed’s fiery Irish fiddling, and Stuart Mason’s songs of old-time Americana. With its all-star lineup of veteran string wizards, Little Black Train will perform vintage fiddle tunes and old-time songs from their new release. From Depression-era gospel to Appalachian and and Celtic dance tunes, they explore the roots of bluegrass that date back to the nineteenth century and earlier. They employ the time-honored folk process to combine new words and melodies with traditional songs from sources such as the Carter Family, Doc Boggs, and Charlie Poole. The new record also includes fiddle tunes from archival sources in West Virginia, Ireland, and Scotland. The band, which has been together since last August, took its name from an old-time gospel number that was the favorite song of John’s four year old son at the time. 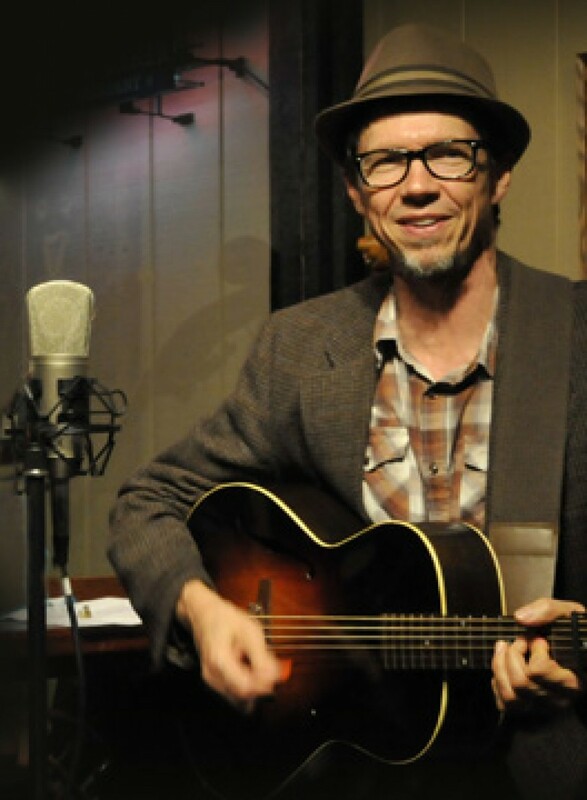 The Clubhouse at This Old House will present the acoustic Americana music of Cuesta Ridge on Saturday April 17 at 7:00 PM, with old-time mountain music by opening act Stuart Mason and James Moore. 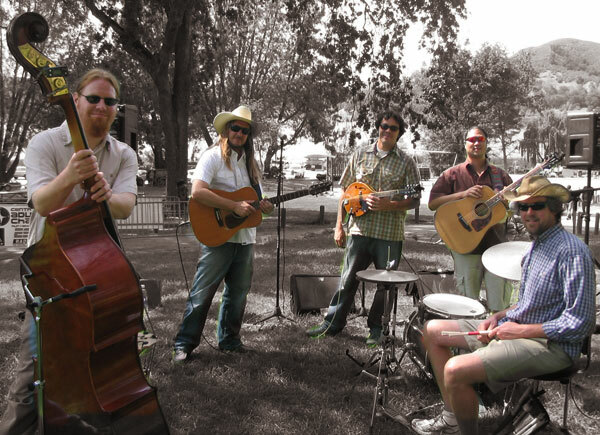 Cuesta Ridge is a five-piece bluegrass-injected Americana-rock conglomerate that has been together since 2004, and their experience in the local music scene is broad. With members also playing in variety of other local bands such as Resination, Hip Deep, Tripledub, Stank Finatra, Ouroboros, The Tipsy Gypsies and Goza, their SLO roots sustain consistent growth. Influences range from Django Rheinhardt, Bill Monroe and David Grisman all the way to Bob Marley, Jane’s Addiction and Motorhead. Previous venues include the Live Oak Music Festival, Morro Bay Harbor Festival, Downtown Brew, California Mid State Fair, SLO Concerts in the Plaza, Mother’s Tavern and Stone Soup Music Faire. The band has a live CD now available for purchase at shows and on CDBaby. The band is pleased to announce its newest member Julie Cooper on fiddle, and plans to release its first studio CD this spring. Molly’s Revenge guitarist Stuart Mason is known for his authentic vocals, melodic mandola, and inability to hold his whiskey. His latest collaboration is a brand new bluegrass-roots CD titled “Little Black Train” with string wizards Kenny Blackwell and John Weed. A native of West Virginia, Stuart has won awards for traditional singing (Goleta Old-Time Fiddler’s Convention), mandola (Topanga Banjo and Fiddle Contest), and songwriting (West Coast Songwriter’s Association). In July a song from his solo release “Appalachian Bride” was selected from among 286 entries to appear on the first New Times Music Awards Compilation CD. Stuart will be joined by James Moore on banjo and harmonica. The Goleta Old-Time Jamboree and 39th Annual Old Time Fiddlers’ Convention and Festival will again present Honeysuckle Possums and Little Black Train on Sunday, April 11 at the Live Oak Unitarian Fellowship Hall (not the sanctuary) in Goleta. The Goleta Old-Time Jamboree is an all-ages community music event that combines a pot luck Sunday luncheon, an open old-time jam session for one hour, and then a double bill concert. The first one was held in February and was considered a success by organizers, who expect the Jamboree to become a regular event. With an all-star lineup of veteran string wizards Kenny Blackwell (mandolin), John Weed (fiddle), and Stuart Mason (guitar and mandola), Little Black Train will perform vintage fiddle tunes and old-time songs from their new release “Little Black Train.” From Depression-era gospel to Appalachian and and Celtic dance tunes, they explore the roots of bluegrass that date back to the nineteenth century and earlier. They employ the time-honored “folk process” to combine new words and melodies with traditional songs from sources such as the Carter Family, Doc Boggs, and Charlie Pool. The new record also includes fiddle tunes from archival sources in West Virginia, Ireland, and Scotland. The Honeysuckle Possums are Susan Reeves, Nicola Gordon, Rebecca Troon, Lisa Macker, and Ruth Alpert. Collectively they play guitar, fiddle, banjo, ukulele, bass, mandolin, tin whistle, and strum stick. The Honeysuckle Possums reach a state of collective musical bliss while playing old-time, original and bluegrass songs and tunes, and then share that slice of heaven. Unconditional love, support and a lot of laughter are a big piece of the pie. Possum audience members are likely to laugh, sing, dance, clap along, and take home a big grin! The Live Oak Unitarian Fellowship Hall is located at 820 North Fairview Avenue, Goleta, CA 93117. Live Oak’s campus, formerly a 1906 farmhouse situated on an avocado orchard, is now a welcoming, homey cluster of buildings, fruit trees, and patios. The concert begins at 2:00 PM with pot luck luncheon and open jam starting at 1:00 PM. No tickets are required but suggested donation is $10 at the door. Bring a dish to share for the pot luck luncheon. The event is sponsored by the 39th Annual Old Time Fiddlers’ Convention and Festival, to be held Sunday, October 10, 2010. Call 805-534-9021 for more information. What do you get when you mash up a virtuosic bluegrass mandolinist, a traditional Irish fiddler, and an old-timey songster? 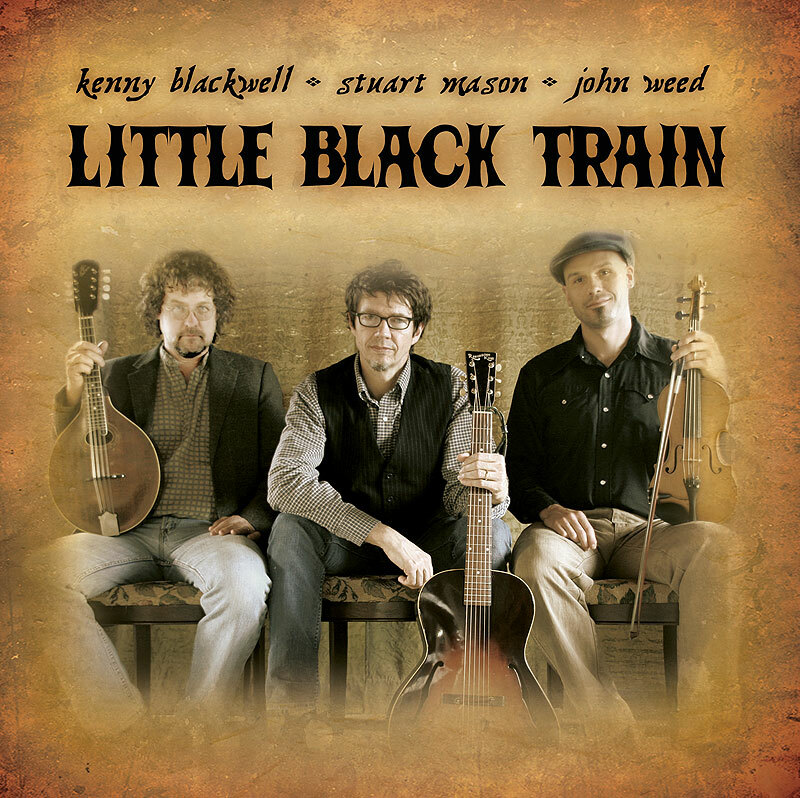 Native Home Music announces the release of “Little Black Train” from Kenny Blackwell, John Weed, and Stuart Mason. From Depression-era gospel to Appalachian and Celtic dance tunes, they dig up the roots of bluegrass that traveled to America from Ireland and Scotland in the 19th century. Avid practitioners of the time-honored folk process, these boys combine new words and melodies with traditional songs from sources such as the Carter Family, Doc Boggs, and Charlie Poole. The new record also includes fiddle tunes from archival sources in West Virginia, Ireland, and Scotland. Spanning holler, hoedown and ballad, thirteen tracks alternate 50-50 between instrumentals and songs, all recorded direct to stereo studio mics without multitracking. Guitarist Stuart Mason is known for his authentic vocals, melodic mandola, and inability to hold his whiskey. A native of West Virginia, Stuart has won awards for traditional singing (Goleta Old-Time Fiddler’s Convention), mandola (Topanga Banjo and Fiddle Contest), and songwriting (West Coast Songwriter’s Association). In 2009 his song “Devil’s Box” from solo release “Appalachian Bride” was selected from among 286 entries to appear on the first New Times Music Awards Compilation CD.